California Claro Walnut slabs, the ‘wing’ like patterns on the left and right ends are from grafts of English Walnut when the tree was young to produce high quality walnuts. The slabs are reclaimed wood from walnut producing trees in Sacramento, CA that find a second life in spectacular lumber, after they have stopped producing nuts. The cabinet cases are constructed with dovetail joints for strength and timeless beauty. The drawers are constructed with precision rabbet and dado joints for a snug and smooth ‘piston’ fit. Elegant bronzed drawer pulls add a contemporary feel to the piece. The base legs have a clean radius with gently arced rails. 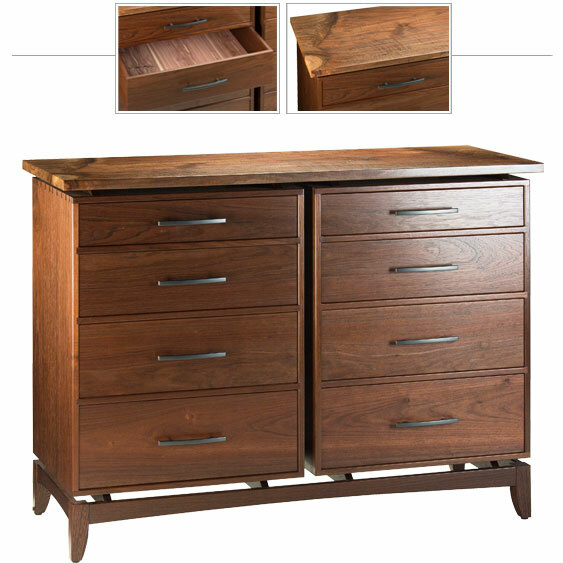 The craftsmanship is superb with beautiful and sturdy joinery and a satin smooth finish.